A few days ago I watched a video from the Jimmy Kimmel TV show that really jolted me. In a typical “man on the street” setup, passers-by were asked to identify a country on a world map. They could identify any country—the U.S., China, England—any one they chose. One by one the viewers failed the test. A few identified Africa as a country, but couldn’t find any country on the continent. At last a boy, who looked as though he might have been in fifth or sixth grade, was asked and he swiftly identified the U.S., Mexico, and a string of countries in South America. As I watched, I couldn’t help but wonder how these people ever followed the news about world events. Hearing news about Syria without having any idea where Syria is would certainly not help anyone understand what is going on in the Middle East. With Google earth and all the digital maps available why are people so geographically illiterate? Making maps is something people have been doing for thousands of years. As knowledge about the world grew, people were able to visualize how the known world was laid out. Instead of being limited to the small area in which they were born and raised, seamen and warriors were empowered to explore larger and larger swaths of the world. One important mapmaker, although little known, was Gertrude Bell, an Englishwoman who mapped much of the Middle East for the British Army in the early years of the 20th century. I wrote a blog piece about her back in 2014 after I had read and been fascinated by her biography. Her work was important in shaping the boundaries of the current countries in that area—for better and for worse. Understanding how modern boundaries came into being can help us see how conflict in the area became almost inevitable. 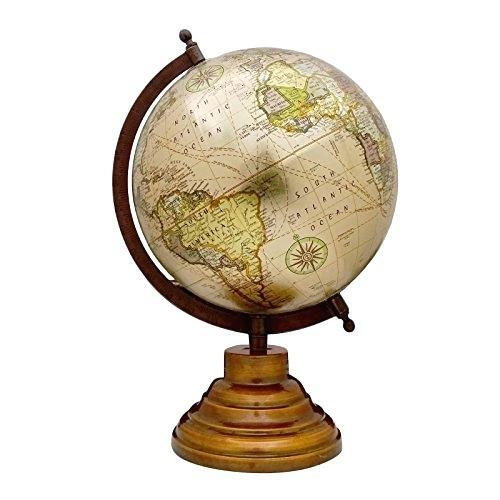 Maps and globes are important in shaping how we see the world. More than ten years ago when I visited Cape Town, South Africa, I saw an art exhibit called Perspectives on Africa. The exhibit was designed to show how differently Africa was viewed by various groups of people. One installation included three world globes hung in different ways—one in the conventional way with the North Pole at the top; the next swung from two points on the equator; and the third with the South Pole at the top. The artist made the point that the conventional way we hang the globe is no more sensible than several other ways. I’ve never forgotten how surprising the “upside-down” globe looked to me. It gave me a new perspective on the southern hemisphere. I am not sure how geography is taught in the schools today, but I am often astonished at the limited knowledge many Americans have of the world outside our borders. Perhaps we should ask teachers to post a large map of the world on the wall of every classroom and a globe in every library. Many children learn about maps by looking at the tiny screen of a phone. Seeing the larger picture day after day might broaden their horizons and encourage them to notice that while Google maps are great for planning trips, they offer only a tiny picture of the world around us. Even now in the 21st century, Google does not rule the world!